How does my summer slip away so fast? I feel like all my weekends have all been pre-booked with very little downtime this summer. Between 5 weddings (3 out-of-town), cycling to Niagara Falls, travelling for a conference and a music festival (more about that one later! ), Rob and I have barely spent much time relaxing over the weekends. Always on the go. Plus, my new rotation this month has a 1-hour cycling commute each way. I come home a tired puppy. As such, I haven’t really been doing my “cook for the week” thing on the weekends. Instead, I am cooking up quick weekday meals. Almost like a normal person. However, I still eat leftovers for dinner as soon as I come home from work. The new meal is for tomorrow’s leftover dinner! I am still on my Thai-kick and decided to combine two of my recipes into one stellar quickie dinner. Instead of a complex coconut-based salad dressing from my Thai Noodle Salad with Mango and Lima Beans, use the coconut milk as a base for simmering vegetables with Thai flavours. You could go all decadent and use full-fat coconut milk from a can, but I used the stuff from a carton again after it worked well with the coconut-braised collards. 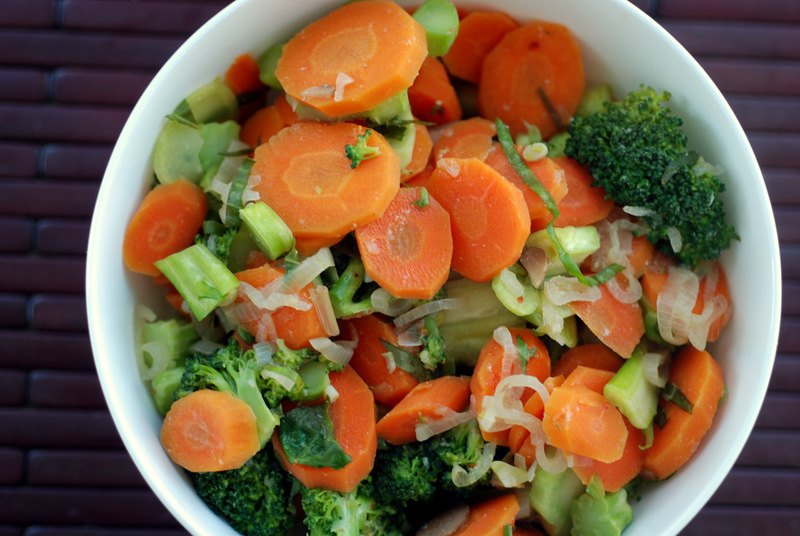 This is a very flexible recipe, so work with what you have to make this a quick dinner. Go all out with Thai ingredients like shallots, Kaffir lime leaves and lemongrass, or use onion, lime zest and skip the lemongrass instead. I used sweet basil but Thai basil would be more authentic, although with that terrible licorice flavour. 😛 Use whatever vegetables you have, and feel free to add tofu or tempeh, too. 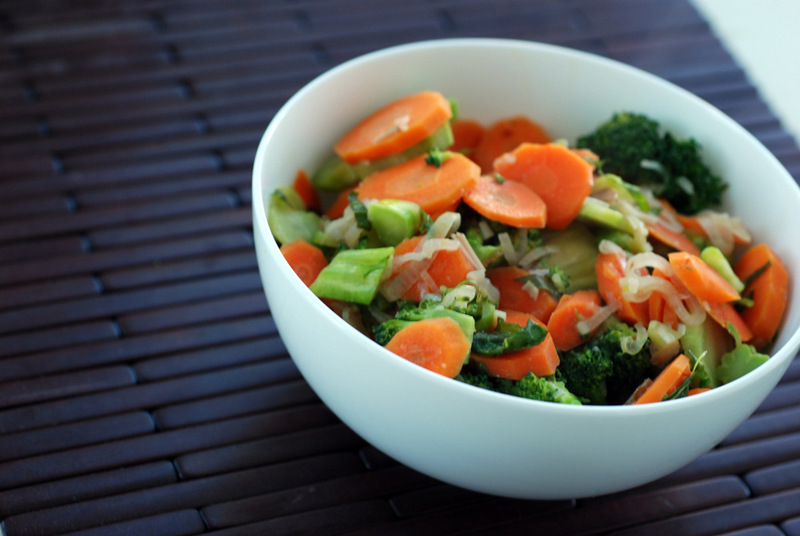 I used broccoli and carrots with great results and served it overtop some cooked quinoa to sop up the delicious sauce. Using the beverage coconut milk makes this a lighter sauce that is still packed with flavour from the aromatics. 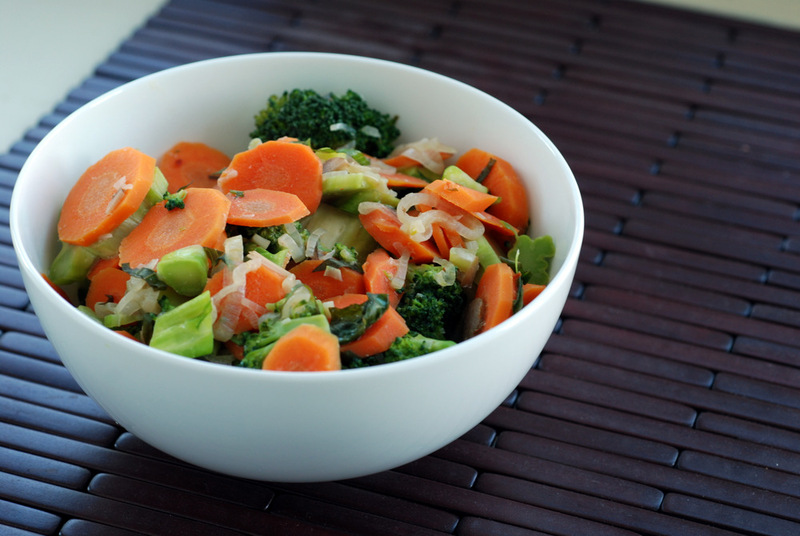 It balances the sour, sweet and hot nicely while served on top of crisp vegetables. Authentic or not, it definitely tastes great. Enjoy! This is my submission to this month’s Herbs on Saturdays. 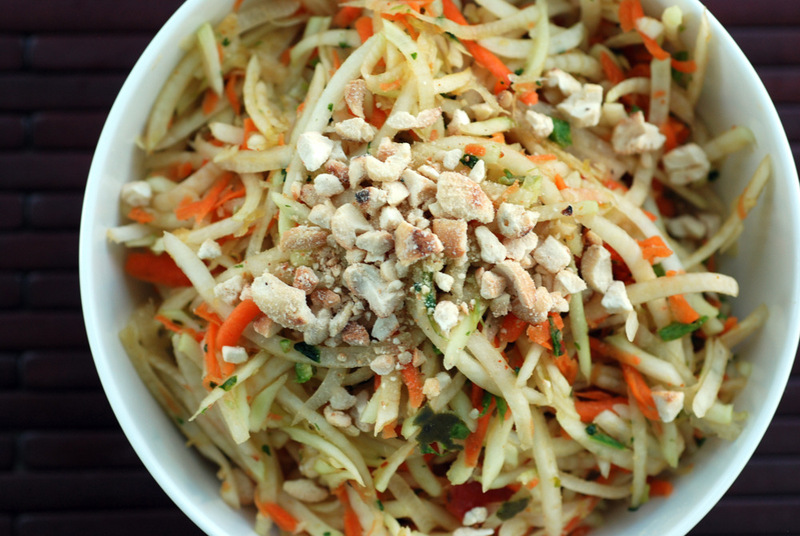 Did you do a double-take when you saw my Thai Noodle Salad with Mango and Lima Beans? It had some exotic ingredients: Kaffir lime leaves, galangal, shallots, tamarind, etc. I know, I thought this was going to be the year of shopping at the Big Box Grocers, too, but it turns out I found a local ethnic grocer, Welcome, that meets the majority of my needs, including all my Thai ingredients, and falls within my budget. It ain’t no Sunny’s though. Sunny’s has bountiful fresh produce at low prices. Even some of the discounted produce is great quality. Welcome, however, is like a transplanted Chinatown grocer. Some great prices but the quality is not always the best. I never know what I will find on their shelves. Sometimes it can be 4 bunches of leeks for $1, or 2 HUGE bunches of Swiss for $1, or 10 limes for $1 (this one seems to be a perpetual sale), sometimes advertised, other times not, especially if the produce is priced to sell pronto (if you know what I mean). Then I’ll come back a few weeks later to discover they have no Swiss chard, or kale or collards at all. The produce is random. Kind of. Like most Asian grocers, they seem to have a regular collection of well priced mushrooms (shiitake, oyster and Portobello), broccoli, citrus, cilantro, coconuts, peeled garlic and some Asian ingredients. Grape tomatoes can be hit or miss. Their cauliflower has never looked good. But, they have Kaffir lime leaves and galangal! They have green mangoes! 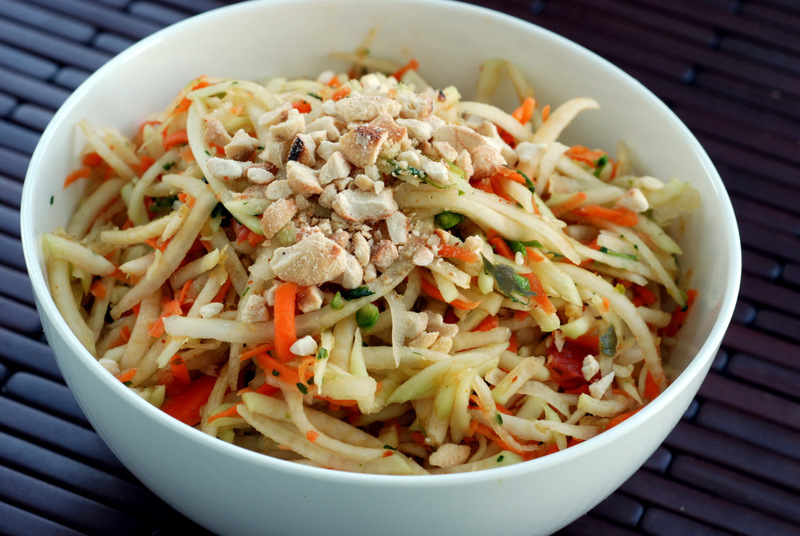 And when I spotted some green papaya, I leaped at the chance to try something new. Itching to go try something authentic with the green papaya, I made the Green Papaya Salad from Taste of the East. I quickly realized that if I had to shred the papaya and carrot by hand, this could take a while, so I whipped out my food processor to help. I added long beans to the recipe and bruised them with the blade, which seemed to be in more traditional recipes. The rest of the dressing was tangy from the Kaffir lime leaves, lime juice, fresh garlic and chile flakes. The nuts offered a nice textural contrast in the tangle of noodly vegetables. Adjust the dressing to suit your own tastes. Trust me that the salad will have a great mixture of hot, sour, salty and sweet. Refreshing during these hot summer days. And yes, as a fore-warning, I think I will be cooking with mushrooms a lot more. I should capitalize on Welcome’s good produce, right? This is my submission to this week’s Summer Salad Sundays and to Deb for this week’s Souper Sundays.